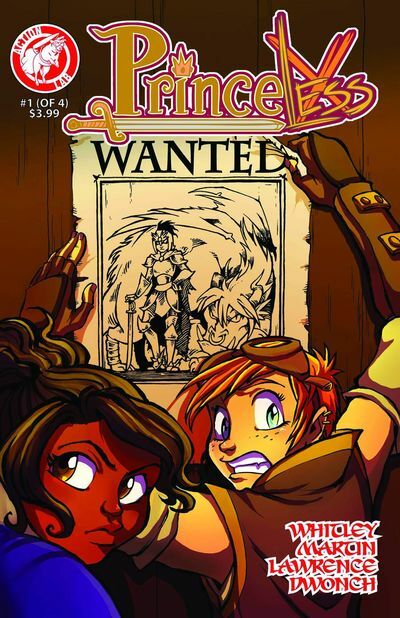 The Fellowship was fortunate enough to obtain a copy of PRINCELESS #1 from Action Lab Comics. Jeremy Whitley writes, and Emily Martin draws. Adrienne and Bedelia are back, and still trying to free the imprisoned princesses. Of course, the king is doing his best to make it difficult; now he’s bringing in outside help. And now Devin, the young prince, is starting to get curious about all of this, and his mother the Queen refuses to talk to him. This is the second series with these characters, and the story jumps in with very little introduction. It really reads like the second story arc in an ongoing series because of that, but that’s not a complaint, I promise. It gives the book a flow that it wouldn’t have if it were re-introducing the main characters. The story has some comedy as well as some serious points, and the art is very fitting to the comic-fantasy tone (and really good). This book would be worth the price if only for the motley crew of “knights” the king assembles to “solve the problem”; they are a hoot by themselves. But there’s a great deal more to it, and it’s a fun read. PRINCELESS #1 (volume 2) is available now at your FLCS or by order from actionlabcomics.com.